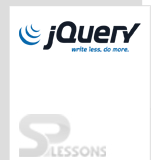 jQuery enables the developer to provide a interface to create cool and wonderful animations and effects on a web page. Some of them are fadeIn, slideDown, hide, toggle etc. In jQuery, number of methods are used to apply effects quickly with a minimum configuration to a web page. jQuery show() method shows the HTML elements of the document and jQuery hide() method hides the HTML elements of the document. speed: This is optional and is represented by three predefined String speed (“slow“, “normal“, “fast“). Otherwise, number represented by milliseconds can also be given. (Ex: 5000). callback: This is optional parameter and is used to represent a function to execute whenever effect is completed. fadeIn() : To fade in a hidden element fadeIn method is used. fadeOut() : To fade out the visible elements fadeout method is used. fadeToggle() : If HTML element are hidden jQuery fadeToggle method is used to fade in a hidden element. speed: This is optional and is pre-defined with three string speeds (“slow“, “normal“, “fast“) or else one can give value represented as milliseconds (Ex. 5000). callback: This is a parameter which is optional and is used to represent a function that executes whenever effect is finished. jQuery slide methods are used to check if the height of an element is visible or hidden in a selected number of elements. jQuery Slide Method mainly supports three methods. slideUp() : This method is used to hide the selected elements with a sliding motion. slideDown() : This method displays the elements that are selected with a sliding motion. slideToggle() : If HTML elements are hidden slideToggle() method displays the selected elements with a sliding motion or HTML elements displays slideToggle() method to hide the selected elements with a sliding motion. In other words, slideToggle() method toggles between slideUp and slideDown methods. speed : This is an optional parameter and is represented with three predefined string speeds (“slow“, “normal“, “fast“) or else one can give value represented by milliseconds (Ex. 5000). callback: : This parameter is optional and is used to represent a function which executes once the effect is finished. The animate() method of jQuery is used to apply custom animations. CSS properties can be used to create their own animations. css_property : This parameter is used to define CSS properties. speed : This is optional and it is represented by three predefined String speed (“slow“, “normal“, “fast“).Otherwise, one can give number represented by milliseconds (Ex. 5000). callback : This is an optional parameter and is used to represent a function to execute whenever effect is finished. Hide/Show ,Fade,Sliding and Animation Effects are the various type of jQuery effects. fadeIn(),fadeOut() and fadeToggle() are the fading effects in jQuery. Up,Down and Toggle are various sliding effects.